They say that when you break a bone, it grows back stronger than before, but that myth has been laid to rest. The truth lies in the process of healing—what bones do when they knit back together. Fractured (the same as broken) bones get immobilized, and thus they start to get weaker. As the body knits the fracture, it deposits calcium at the break site, thus causing a temporary difference in strength between the break and the surrounding bone (without weight bearing and pressure, bone starts to lose its strength). Once the bone has healed and the cast removed, the break site and the bone eventually reach the same level of strength again. We don’t always feel a broken bone, and just because we can walk or move our fingers or toes doesn’t prove that we don’t have a break. But not all breaks happen to our bones. Our breaks-that-are-not-bones? Our heart wounds and soul wounds? We have a choice in how those heal and whether or not we become stronger as a result of the break. I know. I’ve had my share of soul wounds and heart wounds. A husband with cancer. A daughter who struggled with self-harm. Someone dear to my heart who pushed me away. 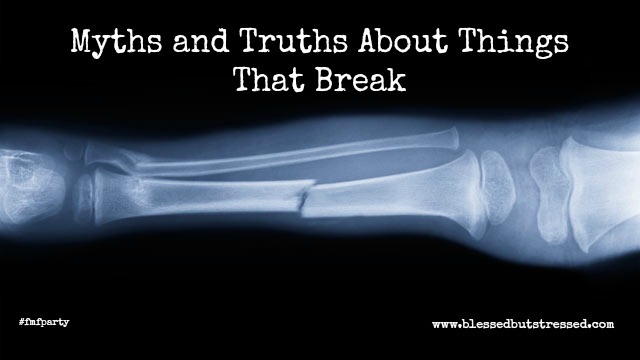 We all have them—those breaks-that-are-not-bones. I have learned to call on the Great Physician to heal those breaks. While my petty prayers may petition instant healing and rapid resolution of what pains me, they allow the Holy Spirit to work within me. Changing me and my desires so that I become stronger during the time of healing. A me that understands human nature more. A me that desires less of me and more of Him. A me that looks with greater compassion on other wounded people. A me that looks a little longer into the eyes of my fellow travelers to see if they might suffer from a break-that-is-not-bone. A me that seeks opportunities to pray for those around me.